LaDell L. Dye, 66, and Mary Ellen Richards Dye, four children, Cove Fort (Utah) Historic Site; Westland 1st Ward, West Jordan Utah West­land Stake. Brother Dye is a Church-service missionary and is a former counselor in a stake presidency, bishop, high councilor, high priest group leader, stake young single adult counselor and Scoutmaster. Retired production department man­ager, Varian Medical Systems. Born in Neola, Utah, to DeLoss and Eva Malnar Dye. 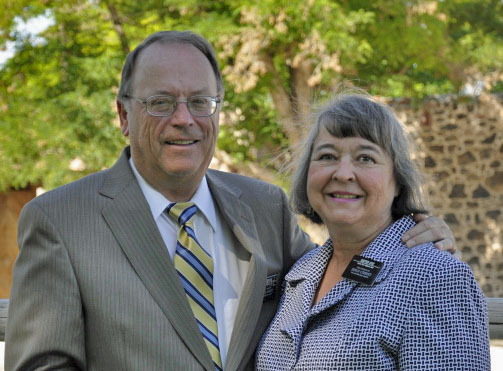 Sister Dye serves as a Church-service missionary with her husband and is a former stake young single adult counselor, ward Primary presi­dent, ward Relief Society president and ward and stake Relief Society secretary. Born in Roosevelt, Utah, to Thomas Andrew and Pattie Lurrine Thacker Richards.